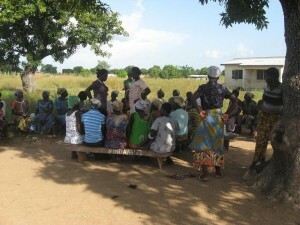 Oct 30, 2012, Bolgatanga, Ghana–Another bright and early start today as we head out to Bolgatanga (Bolga). The two-hour drive was quite scenic, and I was happy to get to see more of the country. October is usually the beginning of the dry season here in Northern Ghana, but the rains have continued to roll into Tamale most evenings for the past three weeks. When I ask the locals about it, they agree that it is very strange, but then shrug, and say with climate change you just never know anymore. Because we are nearing the end of the rainy season, the drive to Bolga is full of beautiful rolling fields of green. CFTC Program Officer, Augustine N-Yokun, points out different fields of maize and rice to me as we drive. 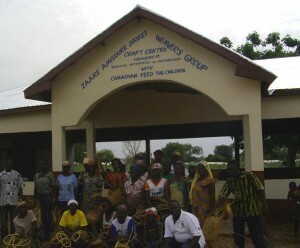 The Zaare Craft Centre: homebase for earning a good livelihood for hundreds of women and their families. We have come to Bolga to meet with CFTC partner TradeAID Integrated. They are doing great economic development work with local communities in the Bolga area, helping to train farmers on effective methods of farming, and facilitating market access for local producers as well as basket weavers. They have been working with CFTC for the past three years, and today I will travel to the Zaare Craft Centre and to the community of Bui to speak directly to our beneficiaries. People like Rhoda Apana, a mother of three. 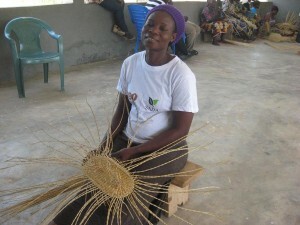 She has been weaving baskets for 20 years, and has spent the last 10 years weaving baskets through TradeAID. “This building provides shade and a safe place for us to come and weave our baskets. Before the centre was built, we would weave in our homes but now because of CFTC and TradeAID, we can easily form as a group during the week to weave quality baskets,” she told me. One of the dozens of Bolga basket weavers who shared their stories with me. Rhoda is just one of four women that I interviewed, and the common theme among all of them was the pride and huge smiles on their faces as they told me that they can now afford to send their children to school and to feed their families because of the income they can depend on through the baskets they weave at the TradeAID Zaare Craft Centre. In the afternoon, we make the 40-minute drive to Bui to meet with a group of women farmers. 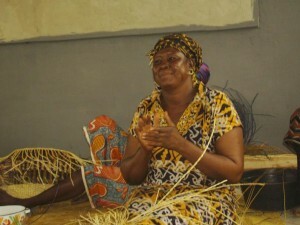 I sit down with Akua Apingu, a 43-year-old mother of five, who has been farming most of her life. She farms rice, maize, groundnut and millet. She was among the first to be identified by TradeAID for assistance in 2000, the same year the organization was founded. Important community decisions are discussed and made under this tree. Many women learn of the opportunities available to them at meetings like these. “TradeAID has helped me so much. They provided training on the best methods of farming: how to sow our crops, the best fertilizer and chemicals to use and how to increase our yields,” she said. Akua was also given a bull ox and a donkey cart through the program. The bull ox helps Akua plough her fields, and the donkey cart enables her to easily transport her crops to market in Navrungo. “For years I farmed a half acre of rice, but since my training with TradeAID, I have increased my capacity to three acres, and I can now support my family,” she said. After a few more interviews, I ask if it would be possible to see some of their fields. They all readily agree, and we make the journey down a rutted dirt road towards their fields. As we crest the top of the last hill before the fields, I am struck by how beautiful and incredibly green the fields of rice are. We cross a small stream to get to the fields. This water comes from the Tono dam in the area, which ensures that the women can continue to farm during the dry season from October to April. As we make our way back from the fields, we stop occasionally to let the women farmers off at each of their houses and villages along the way. I thank each of them individually for taking time to talk to me, and they smile and nod and grasp my hand and thank me for coming. We make our trip back to Tamale as the sun sets, and as we reach the city limits of Tamale, I feel very lucky to have spent the day witnessing firsthand the how a program like this truly impacts the everyday lives of people here in Northern Ghana. Tomorrow I am off to meet with our partner RAINS, and the communities of Sang and Kpachelo. More to come then!